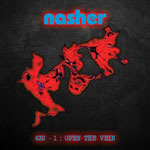 Share the post "Album review: NASHER – 432-1 Open The Vein"
Whatever happened to Frankie Goes To Hollywood guitarist Brian ‘Nasher’ Nash? The opener – ‘Salt In Her Veins’ – sounds like you’ve put the radio on FM by mistake and it’s drifted ‘off station’. But the lapping sounds of the Mersey gives way to acoustic guitars and a rather fine, unapologetic and unrequited, homage to his home town. It may not be a Trevor Horn production but 432-1 is nevertheless rather beautifully constructed and, perhaps not unexpectedly, a decidedly thoughtful, evocative, social commentary. No guesses needed which way Nasher voted in the General Election. For the more anally minded, the 432 of the title represents all of the instruments being tuned to 432 Hz, as opposed to the standard 440 Hz, a technique used by the Nazis to make propaganda broadcasts harsher on the ear. But there’s nothing harsh on the ear about 432-1, and while he may have left Liverpool, defecting to the capital back in ’83, the album reveals Nash to be a far more skilful, insightful and articulate singer songwriter than those who’ve not followed his post Frankie career (solo albums Ripe in 1999, and Le Grande Fromage in 2002) might expect. This entry was posted in ALBUM REVIEWS, ALBUM REVIEWS (Mobile), All Posts and tagged 432-1 Open The Vein, album, Brian Nash, Frankie Goes To Hollywood, Nasher, pop, review, rock, singer, songwriter. Bookmark the permalink.